Attorney John J. Malm has obtained substantial settlements for clients who have suffered bone fractures as a result of a car accident, slip and fall or work-related injury. Broken bones, referred to as fractures, are among the most common orthopedic injuries. 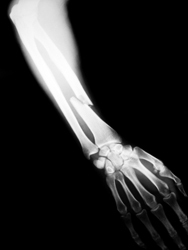 Many fractures require a cast, but often treatment of a broken bone requires surgery. In severe cases, the orthopedic surgeon will install “hardware,” such as screws, plates, or metal rods in a procedure known as an open reduction internal fixation (referred to as an “ORIF”). In some patients, the installed hardware will be removed in a secondary procedure, while in other cases the hardware becomes integrated with a patient’s bones and is permanent. See, Ortho Info. Unfortunately, many patients who experience orthopedic injuries are prone to loss of mobility, increased discomfort, and even arthritis over time. Accordingly, damages for future medical costs and other related damages should be considered before settlement. If you have suffered a bone fracture or another orthopedic injury, you should speak to an experienced attorney and obtain an evaluation of your important claim right away. Car accident, injury to minor, bone fractures. DuPage County, Illinois. A Policy-limits settlement for $250,000 was recently reached on behalf of an injured minor, who suffered multiple displaced fractures in her right arm, requiring an open reduction and internal fixation (ORIF) of the right radius and ulnar bone, and a closed reduction internal fixation of the right distal radius. The minor was a passenger involved in a rear-end-type automobile accident. Evidence indicated that the driver of the car was at fault in causing the accident. (No lawsuit filed).